Energy efficiency and renewable energy (EERE) resources can, and do, reduce carbon emissions that would otherwise be released from electric power generating units (EGUs) on the grid. This “emissions displacement” occurs as new zero-emitting energy efficiency or renewable energy resources eliminate or reduce the need for megawatt‐hours (MWh) of generation from fossil‐fired EGUs. Typically, EERE displace operations from a mix of EGUs that burn coal, natural gas, and occasionally oil; once installed, EERE resources are essentially free to operate so they are called on to run before fossil-fired EGUs. Beyond displacing generation on a given day, the addition of clean EERE resources can reduce the need to expand or build new fossil-fired EGUs. Likewise, EERE can result in earlier retirement of high-carbon emitting units. Overall, by reducing operations (MWh), avoiding capacity (MW), or expediting retirements (MW) of fossil-fired EGUs, new EERE resources displace emissions. 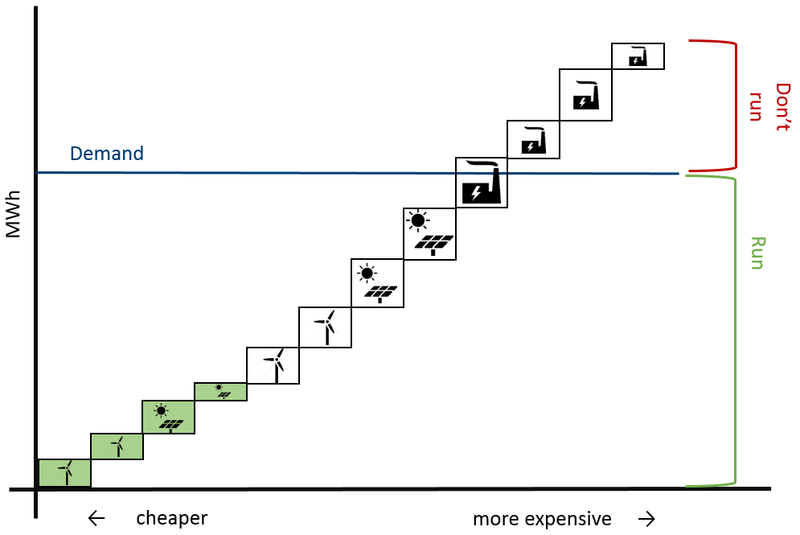 The degree to which clean energy resources reduce emissions is dependent on a number of factors, primarily the type and amount of other generation resources displaced. In a recent report, Synapse provides evidence that “the larger the proportion of higher carbon-emitting resources in a region’s existing generation capacity mix, the larger role energy efficiency and renewable energy can play in displacing CO2 emissions.” The figure below (excerpted from the report) highlights the regions with higher proportions of coal-fired EGU resources in their generation mix, and their comparatively higher displacement rates. In its final Clean Power Plan ruling, released August 3, EPA explicitly accounts for the energy (MWh) and CO2 emission displacement effects of RE in the determination of the Best System of Emission Reduction (BSER) for fossil EGUs. This is a change from the proposed rule, in that the final rule increases the stringency of target emission rates, supplementing the MWh fossil generation in the denominator of the rate with the amount of new RE that displace fossil resources. The simple schematics below depict the main difference between EPA’s proposed versus final approach to BSER and setting emission rate targets. 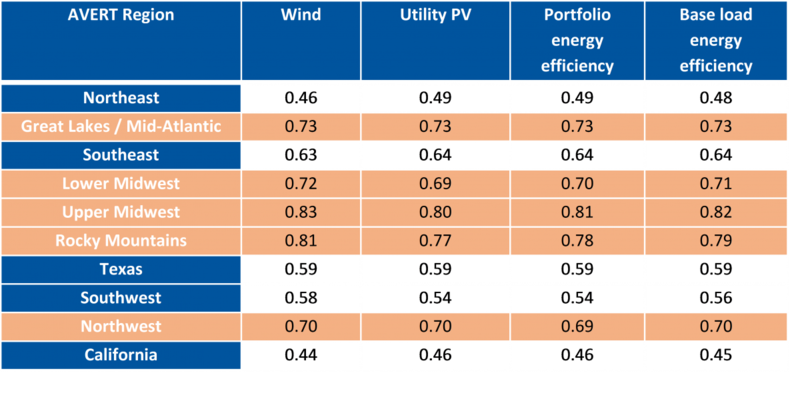 These Emission Rate Credits (ERCs), measured in MWh, can be generated from many different types of clean energy resources (EERE included), and they are precisely the mechanisms EGUs will use to dilute their stack emission rates down to their performance emission rate target. The catch? ERCs can be traded across state lines and even between states in different regions, provided that the states buying and selling ERCs are both using the same rate-based compliance option (source category specific rates), or a producer in a mass-based state holds a power purchase agreement with the rate-based state. EPA included this trading option to increase flexibility in meeting targets and take advantage of a well-known mechanism for reducing emissions in an economically efficient way. However, we know from past experience, the existing literature, and Synapse’s own modeling that the potential for CO2 emission displacement varies considerably from region to region across the United States. As a result, the emissions displaced where an ERC is produced may differ substantially from where it is used. This characteristic of displaced emissions can ultimately place stress on CPP’s overall CO2 emission reduction goals. Unlike mass-based (i.e., cap) targets that have an explicit level of policy certainty baked-in, rate-based targets do not come with a definitive amount of CO2 that will be released to the atmosphere. The requirement is simply that the rate is met. For example, a unit that has a 1,305 lb CO2/MWh target can meet this requirement in an infinite number of ways. It can generate 1,000 MWh and release 1,305,000 lbs CO2 total. It can generate 5,000 MWh and release 6,525,000 lbs CO2 total. While the unit is compliant under both scenarios, two very different amounts of CO2 have been released to the atmosphere. There is no cap that precludes this from happening. When you add to this the fact that a unit can show compliance with the target rate using market-purchased ERCs from other states and/or regions, you add an enormous amount of complexity to an already existing challenge. 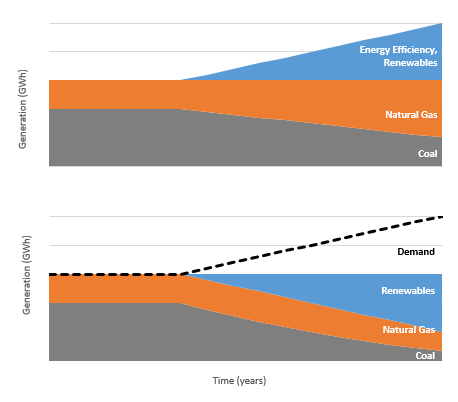 The assumption that is directly implied by a unit being able to use a market-purchased ERC towards compliance with its rate-based target—and the assumption that needs to play out in reality to keep the Clean Power Plan’s CO2 reduction goals in check—is that each MWh generated by the “ERC-producing” resource has displaced (somewhere on some grid) the release of the exact number of CO2 lbs represented in the “consuming” unit’s numerator. However, if the ERC is generated by a resource that actually displaces less than 1,305 lbs CO2 for the MWh electricity it generates (for example, if the ERC is generated in a comparatively fossil-light region), then more CO2 will be released to the atmosphere than is accounted for by the ERC. In this case, because the CO2 tons won’t “travel” with the ERC itself in the ERC marketplace, and there is no requirement that ERC-consuming units need to make up any shortfall of displaced tons represented by the ERC—any CO2 emissions released at the ERC-consuming unit’s stack above and beyond the CO2 emissions that are actually displaced by the ERC-producing unit diminish the emissions reduction goals of the policy. These emissions were released to the atmosphere, but not detected in the Clean Power Plan compliance books. What can we do over the ensuing year to make sure that CO2 emission reductions are not less than the Clean Power Plan anticipates? Synapse invites you to continue tuning in to our ongoing series of webinars as we explore this and other topics related to the final rule in the coming weeks.